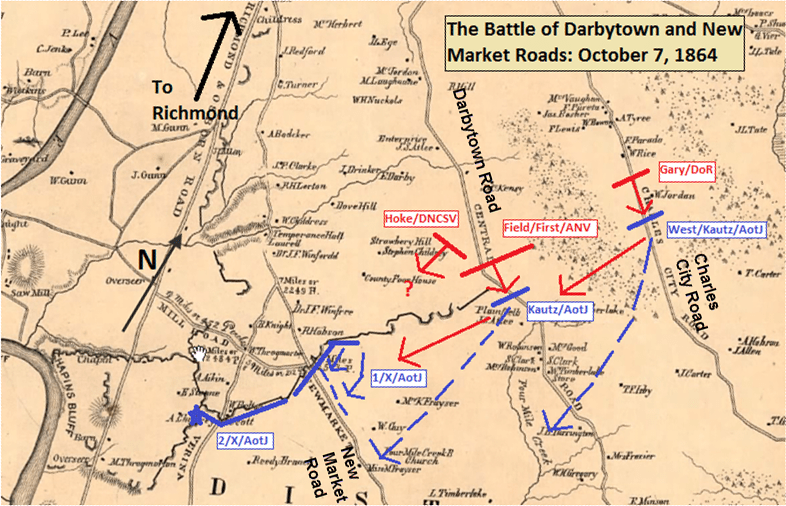 Note: Click to see maps of the Battle of Darbytown and New Market Roads, which should help you follow along with the action. Brief Summary: Robert E. Lee’s second to last planned offensive of the Civil War was put into effect on October 7, 1864, 150 years ago to the day. From the moment Benjamin Butler’s Army of the James wrested control of Fort Harrison from the Confederates on September 29, 1864, Lee had been looking for ways to reverse the damage. An uncoordinated frontal assault the following day led to a bloody failure. A week later, Lee would try again. The Battle of Darbytown and New Market Roads was thus an extension of the Fifth Offensive. The situation had not returned to relative equilibrium. Instead of attacking frontally, this time Lee would try a grand flanking movement. He would try to utilize the numerous east-west roads running out of Richmond for this task. The Union Tenth Corps held a line from Fort Harrison northeast to just past the New Market Road, the southernmost of these roads. Kautz’s cavalry division from the Army of the James held the Darbytown Road, the next thoroughfare to the north. Another detachment of Kautz’s cavalry also picketed the Charles City Road even further north. Lee planned to take two divisions, those of Field and Hoke, as well as a powerful artillery force under First Corps chief of artillery E. Porter Alexander, and swing wide around the flank of the Union infantry. Field, along with Gary’s cavalry brigade, would hit Kautz’s forces guarding the New Market Road in front and flank. After dealing with Kautz’s main force on Darbytown Road, Lee’s entire force would continue to move quickly south in an attempt to turn the Yankee infantry’s right flank and drive them all the way to the James River. The ideal goal was to reestablish the Confederate lines as they had been before the Fifth Offensive started. Unfortunately for Lee, the plans were not executed as drawn up. The initial attacks against Kautz’s Northern cavalry were a resounding success, with the Federals being driven unceremoniously from their posts on the Charles City and Darbytown Roads. Alexander Cheves Haskell, commander of the 7th South Carolina Cavalry of Gary’s Cavalry Brigade, distinguished himself and suffered a near mortal wound in personally leading the attack against Kautz. The plan faltered when the Tenth Corps infantry division of Alfred Terry managed to refuse its flank along the New Market Road. As at Fort Harrison, some of these men were armed with seven shooter repeaters, and their volume of fire stooped Field’s Division dead in its tracks. To make matters worse for the Confederates, Field and Hoke seem to have had trouble cooperating for a third time at the Siege of Petersburg. Hampton Newsome, author of Richmond Must Fall, isn’t entirely sure what Hoke was doing northwest of Field that day. He could have attacked at the same time and applied more pressure to the point where the Federal line bent back along the New Market Road. Instead, he appears to have done little to nothing that day. The end result was another bloody repulse. John Gregg, commander of the Texas Brigade, was killed in this fight. The Confederates suffered another 700 odd casualties to only about 450 for the Federals. Strategically as well as tactically, this was a resounding Union victory. Lee’s offensive failed, and afterwards, the Confederates began digging a new line to the northeast from near Fort Harrison to parallel the now solidified Yankee lines in the area. Butler and Grant had a permanent, and large, bridgehead from which to launch strikes against Richmond. Lee’s lengthy lines had to grow even longer. He was being slowly stretched to death by Grant’s methodical blows.